This year, an estimated 1.6 million athletes will sustain a concussion, and many of them will go undiagnosed. Athletes who resume playing in a sporting event before fully healing after a concussion can experience permanent brain damage, and even death. Unfortunately, this happens all too often. Nearly one-third of athletes have sustained a concussion that went undiagnosed and risked further brain injury, according to the Clinical Journal of Sport Medicine. For a group of second-year medical students at Texas Tech University Health Sciences Center El Paso (TTUHSC El Paso), those statistics were unacceptable. “We thought, ‘How can we solve this problem? How can we get players and coaches to take these injuries seriously?’” Oaxaca said. 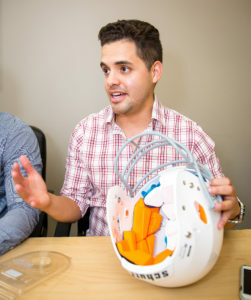 The medical students’ answer: a smart helmet capable of detecting an impact and notifying the team medical staff after the hit has occurred. This way, players can be taken off the field immediately, instead of continuing to participate while injured. This innovative technology has landed the entrepreneurs spots as semi-finalists in the Space Race, a rigorous international start-up competition hosted by NASA and the Center for Advancing Innovation (CAI). Part of the challenge is to reconfigure a patented NASA technology that’s used in space for everyday use on Earth. The medical students — who have backgrounds in physics, psychology and even engineering — selected NASA’s “self-aware,” or intelligent wiring system for the project. The wires instantly detect damage or defects and pinpoint the location of the problem. “In space, the technology can tell astronauts exactly where a rock or meteor impact occurred on a spacecraft so that they can address the problem right away,” Oaxaca explains. Now, those capabilities are being translated to helmet impact sensors for the Space Race. But the group is also patenting its own unique technology that it’s developed along the way. Williams serves on the Board of Directors for the Hub of Human Innovation, a local technology incubator that nurtures the development of small businesses. 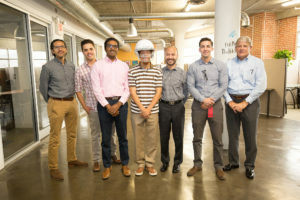 The Hub has supported the students throughout their participation in the Space Race, as has Joel Quintana, a Ph.D. electrical engineering candidate at UTEP. Quintana is advising the students as they develop new algorithms and theorems for the prototype. 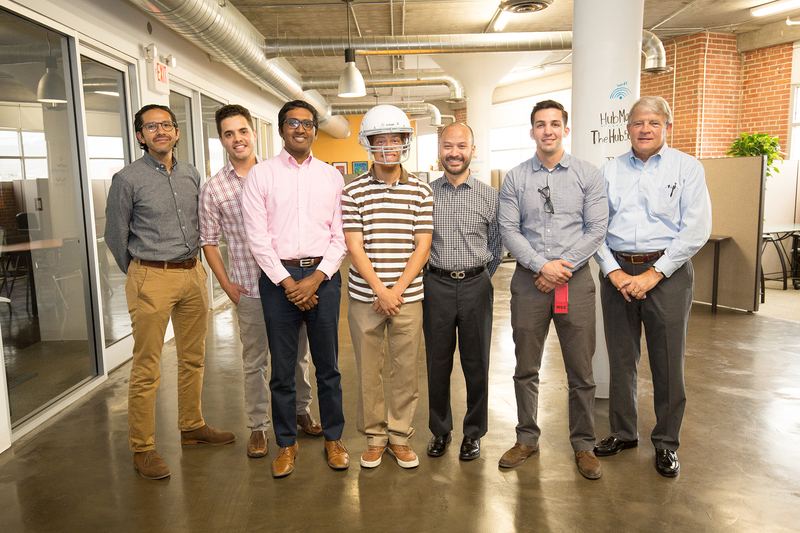 The group admits that there are smart helmet competitors out there. But they believe their innovation has an edge. Besides its integration with cutting-edge NASA technology, the helmet will have additional capabilities. Scientists don’t know the exact force that will unequivocally result in a concussion. But recent research shows that a combination of data from the blow can help doctors make a more accurate diagnosis. These impact mechanics — rotational acceleration, linear force or acceleration, duration of impact and location of impact — are all recorded by the helmet’s sensors to provide a full medical assessment. The team’s marketing approach is also unique. Instead of selling an expensive smart helmet, the plan is to sell the sensors individually as accessories. That means customers won’t need to purchase a brand new helmet if they already own one. The goal is for the product to be sold in athletic stores or directly to athletic programs, such as high school sports teams, under the name Minus Tau. Tau is a protein that forms in the brain when someone experiences a concussion, or any form of brain damage. Today, many retired NFL football players who experienced repetitive head injuries during their careers suffer from chronic traumatic encephalopathy, a degenerative brain condition tied to dementia, suicide and depression. Studies have shown high levels of tau in these players’ brains, prompting scientists to suspect that tau build-up is linked to increased risk of developing a brain disorder. Also on the team are second-year TTUHSC El Paso medical students Tyler Trevino, Justin Thomas and Sovanarak Lek, and Toriell Simon, an undergraduate business student at The University of Texas at El Paso. In total, the Space Race challenge highlights 11 NASA technologies, which teams utilize to build and pitch their business plans. Phase 3 of the Space Race competition commences Friday, October 14, with the announcement of the finalists. Winners of the third and final phase of the competition will incorporate a business, apply for a NASA license, raise up to $1.2 million in seed funding from venture capitalists and officially launch a start-up with guidance from CAI.